With a single magic word, Billy Batson transforms into a Shazam: a hero who possesses the wisdom of Solomon, the strength of Hercules, the stamina of Atlas, the power of Zeus, the courage of Achilles and the speed of Mercury! It's one of the best premises in the history of superhero comics, and arguably the first major improvement on the archetype pioneered by Superman. But things haven't always been easy for the superhero known affectionately as the Big Red Cheese. Despite overwhelming popularity in his early days, he was absent from the comics page for over two decades, had difficulty finding an audience when he returned, and had a 77-year journey back to the big screen. 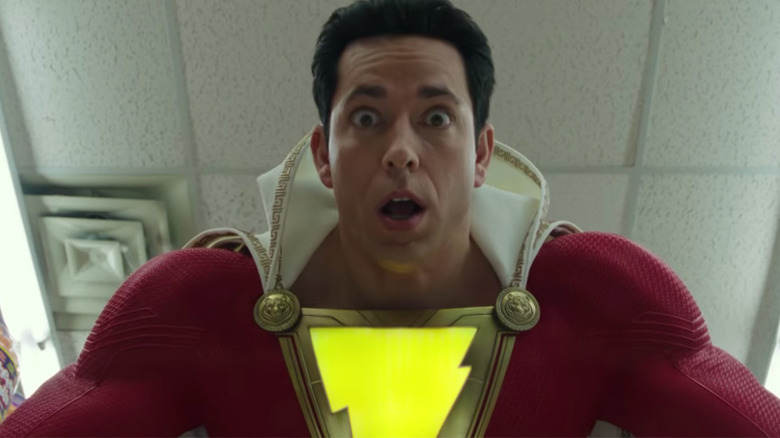 From the lawsuit that took him out of comics to his status as one of the most highly anticipated movie heroes of the decade, here's the untold truth behind Captain Ma — er, Shazam! We probably don't need to tell you that after his debut in 1938, Superman was a huge success. So successful, in fact, that by the time the '40s rolled around, he had inspired a massive boom for the brand-new superhero genre, including a huge wave of imitators and ripoffs. Dozens of new titles hoped to create the next Superman, and while most of them are justifiably forgotten today, Fawcett Publications was one publisher that actually managed to do it. In February of 1940, writer Bill Parker and artist C.C. 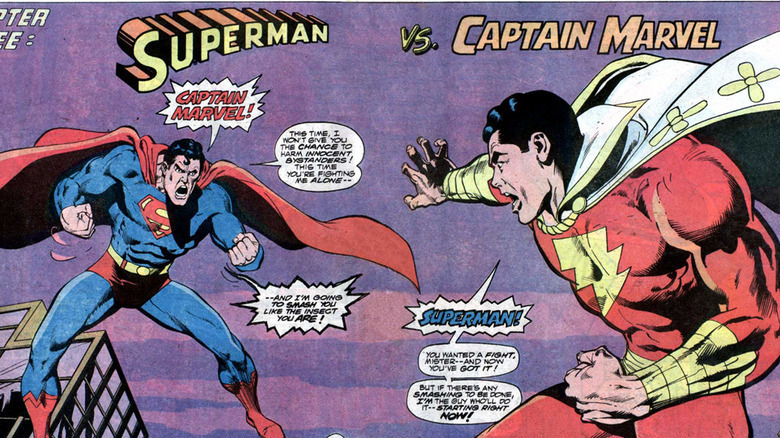 Beck introduced the world to Captain Marvel, a character who had all of Superman's powers, but with two key differences. First, while Jerry Siegel and Joe Shuster had rooted their character in sci-fi — and even gone so far as to provide "realistic" explanations for his powers in Action Comics #2 by comparing them to the proportionate strength and leaping abilities of grasshoppers and ants — Captain Marvel's origins were drawn from a more magical, mythological source. Second, and far more importantly, their mild-mannered secret identity was a kid. Billy Batson, a homeless ten-year-old newsboy who'd been cheated out of his inheritance, was chosen by the wizard Shazam. With a single magic word, he could transform into an adult who wielded the powers of six mythological heroes, turning him into the World's Mightiest Mortal. In other words, every kid who wished they were Superman could now read the adventures of a kid who could become Superman whenever he wanted. With that idea — and beautiful, action-packed artwork from Beck that was genuinely better than anything else on the stands at the time — Captain Marvel was an instant success. If you've got a good memory for trivia, you might already know that Billy Batson and his magical alter-ego made their debuts in the very first issue of Whiz Comics. Which, of course, was Whiz Comics #2. That might seem confusing, but that's only because it is. Before debuting a new title, publishers would often create "ashcan" editions — cheap, low-quality versions with low print runs that they could use as proof-of-concept to attract potential advertisers and secure a copyright. They'd done the same with Parker and Beck's new character, then called Captain Thunder, but still hadn't settled on a title, publishing it as both Thrill Comics and Flash Comics, a title that was already in use for another hero in a red costume with a lightning bolt on his chest. By the time they got to publication, they'd decided to go with Whiz, as a reference to what was then Fawcett's best-known publication: an adult comedy magazine originally meant for a military audience called Captain Billy's Whiz-Bang. Since they'd already published the story in the ashcan, Whiz started at #2… even though they'd technically printed it twice already. It all worked out, though. For reasons unknown, Whiz had two different issues labeled #3, so even if it started with #2, the numbering actually matched up after #4. 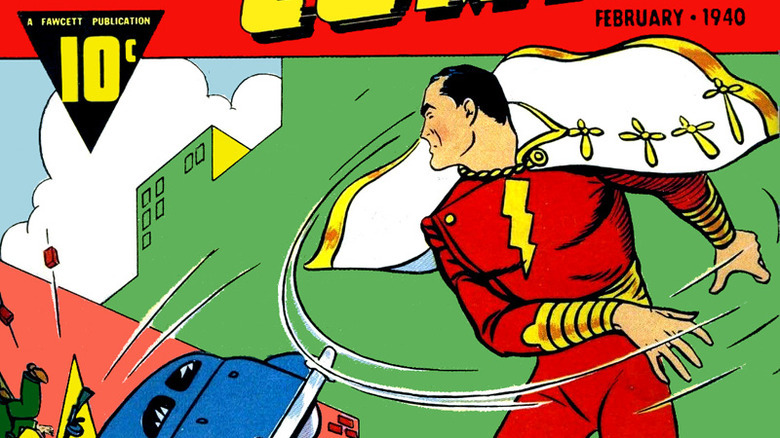 Superman might've been the OG, but as the '40s went on, Captain Marvel quickly became the most popular superhero of the decade by outselling Superman and Action Comics. According to the Museum of Comic Book Advertising, Captain Marvel Adventures — a biweekly solo title launched in 1941 that became the flagship of Fawcett's line — would eventually hit a high point of 1.3 million sales per month. That's an impressive figure under any circumstances, but consider that over the course of those same years, Captain Marvel and his sidekicks were also appearing in Whiz Comics, Wow Comics, Master Comics, Captain Marvel Jr., Mary Marvel, and The Marvel Family. 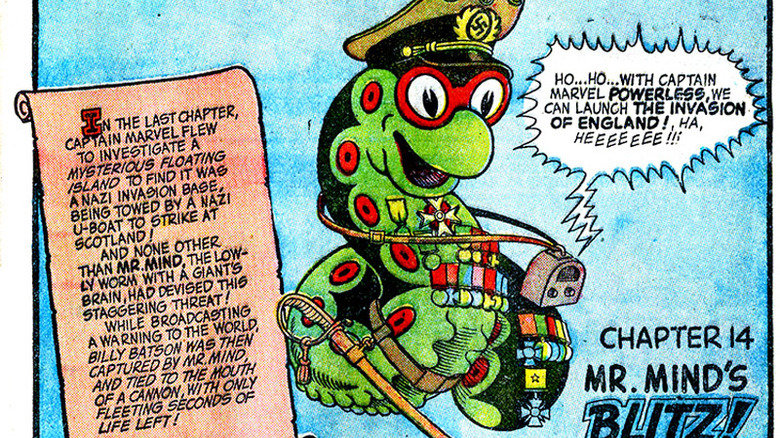 In fact, he was so popular that Hoppy the Marvel Bunny, a Bugs Bunny-esque rabbit version of Captain Marvel created for Fawcett's line of funny-animal comics, was headlining not one, but two titles every month. For comparison, Superman and Batman each had three — and one of them was World's Finest Comics, the series they appeared in together. If you ever go back and read any comics from the '40s, it's not difficult to figure out the secret of their success: they're actually good. 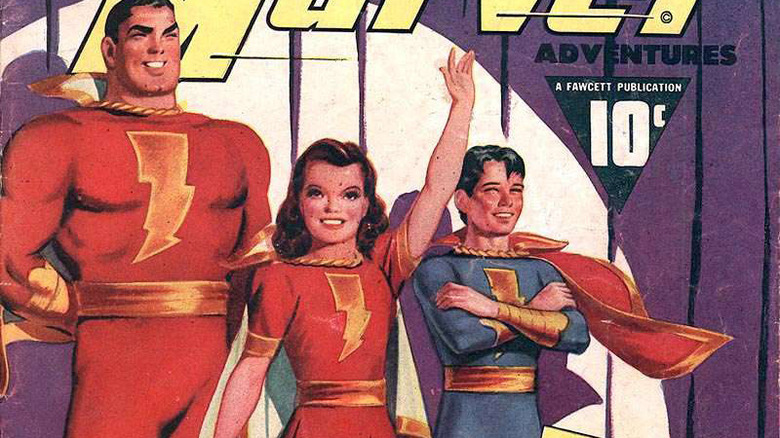 While a lot of Golden Age creators struggled with figuring out the rules of the new medium and the superhero genre, the Captain Marvel stories presented fun, straightforward, and well-constructed adventures. C.C. 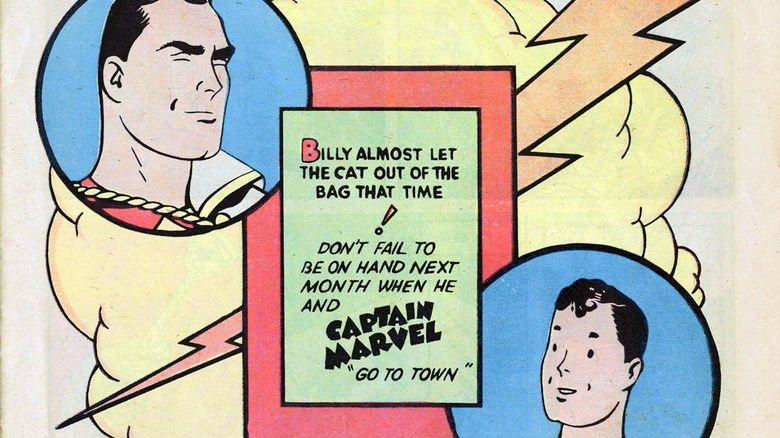 Beck's art had always been fantastic, and Mac Raboy's art on Captain Marvel Jr. would go on to inspire Elvis Presley's signature style, but the arrival of writer Otto Binder was the final ingredient needed to make Captain Marvel great. Binder and Beck would become the team most identified with the character, and in 1943, they created what is generally considered to be one of the most important stories of the Golden Age: "The Monster Society of Evil." It was an epic story that ran through a full 25 issues of Captain Marvel Adventures, the first long-form, multi-part superhero story in comics. It was also the first story to feature a villainous super-team made up of pre-existing villains who united to take down the heroes, paving the way for the modern-day event comic and, according to many Golden Age Captain Marvel fans, featuring some of Binder and Beck's best work. Unfortunately, while Fawcett instituted a "Code of Ethics" for creators that prohibited stories that "indicate ridicule or intolerance of racial groups" in 1942, it's also full of extremely racist elements. Japanese people are presented in a particularly negative light, to the point of being drawn with pointed fangs, a common trope in comics published during World War II. It also features Billy Batson's assistant, a relatively obscure black character named Steamboat who was drawn as a Minstrel Show-style caricature and spoke with an over-the-top "southern" accent, and who wouldn't be dropped from the comics until 1945. Despite the story's historical significance, those regrettable choices were offensive enough that for decades after acquiring the rights to the character, DC opted to avoid reprinting it, with the only modern version being a limited print run from 1989, published by a different company. In 2018, DC announced plans to collect the saga in a hardcover of their own — but quickly canceled them after a backlash. As you might've already guessed, National Comics, the company that would later become DC, was not happy about Captain Marvel outselling Superman. So unhappy, in fact, that they filed a lawsuit against Fawcett that made it to court in 1948, alleging that they'd violated the copyright on Superman by ripping him off wholesale for their own character. Unfortunately for Fawcett, that actually is what happened. In a much later interview, Roscoe Fawcett would recall telling his staff "Give me a Superman," with his only other specification being that his secret identity should be a kid. Even beyond that, the similarities were impossible to ignore. Superman didn't have the market cornered on super-strength and invulnerability, but Captain Marvel did spend most of his time battling his arch-nemesis, an evil bald scientist, and the cover to Whiz #2 featured him tossing a car, much like Superman on the cover of Action Comics #1. In 1954, the courts ruled against Fawcett, and they lost the rights to continue publishing Captain Marvel stories. The spirit of Shazam did live on, though, in a pretty ironic way. After the suit, Otto Binder would take a job at DC and become one of the primary architects of Superman in the Silver Age. Not only did he bring the same kind of stories to Superman that he'd been doing for Captain Marvel, he wound up introducing some of the most famous pieces of the Superman mythos, including the Bottle City of Kandor, and a very Mary Marvel-esque character you might've heard of called Supergirl. After the infamous lawsuit, Captain Marvel's adventures ended in 1954, and while he wouldn't be seen on the comics page again for almost two decades, a character that was selling over a million copies a month doesn't just vanish from pop culture. Plenty of readers had fond memories of the Big Red Cheese, and plenty of publishers were eager to recreate that level of success. In the United Kingdom, a publisher called L. Miller and Son drafted artist Mick Anglo to create an unofficial continuation of the series. The character was renamed Marvelman (with Captain Marvel Jr. and Mary Marvel recreated as Young Marvelman and Kid Marvelman, respectively), and the magic word was changed to "Kimota." Since the British printings of Captain Marvel had ended at #24, Marvelman picked up at #25. It ran from 1954 to 1963, but in 1982, the strip was revived in the pages of Warrior, where it was rebooted in a much darker direction by Alan Moore and Gary Leach, and served to pave the way for later Moore projects like Watchmen. 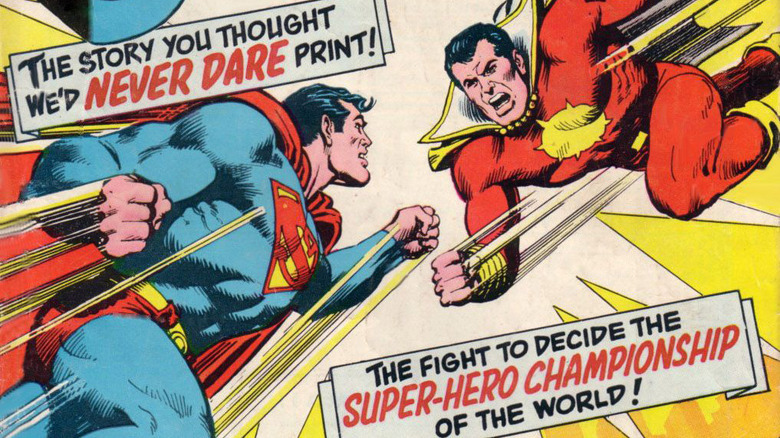 Eventually, readers even got to see a comic book version of the lawsuit when Superman finally took on Captain Marvel in a fight… sort of. In 1974, a story introduced the Man of Steel to Willie Fawcett, a youngster who could rub his magic belt buckle and say a magic word to transform into Captain Thunder — with the strength of a Tornado, the speed of a Hare, and… well, you get the idea. A traveler from another dimension, he fought Superman thanks to the influence of the "Monster League," but was eventually defeated. It's a fun story, but it left many readers disappointed that Superman slugged it out with a knockoff rather than the genuine article. Especially since DC was already publishing a new Shazam comic. In 1972, DC publisher Carmine Infantino, who had broken into comics as a teenager in the Golden Age, decided that Captain Marvel had been absent long enough. With that, DC licensed the characters from Fawcett, and began publishing all-new adventures of "the original Captain Marvel" in the pages of Shazam! The first issue was drawn by C.C. Beck, and featured Otto Binder — who had left DC in 1969 to focus on sci-fi novels — as a character in the first issue. The series would run for 35 issues, bringing the Marvel Family to a new generation of readers and incorporating them into the DC Multiverse. Readers weren't just reintroduced to the good guys, though. In Shazam #28, E. Nelson Bridwell and Kurt Schaffenberger would revive Black Adam, an evil version of Captain Marvel who had made his only appearance 32 years earlier. While he lost that first fight, he'd go on to become one of DC's most prominent villains — and an occasional hero. Whatever happened to "Captain Marvel"? When DC revived the Big Red Cheese in 1972, it was in a series called Shazam, and by 1974, they'd been prohibited from referring to their lead character as "Captain Marvel" on the cover at all. The reason? An upstart superhero publisher had snatched up the copyright on that name for a new character they'd introduced in 1967. It made sense that they would, too. After all, their company was called Marvel Comics. 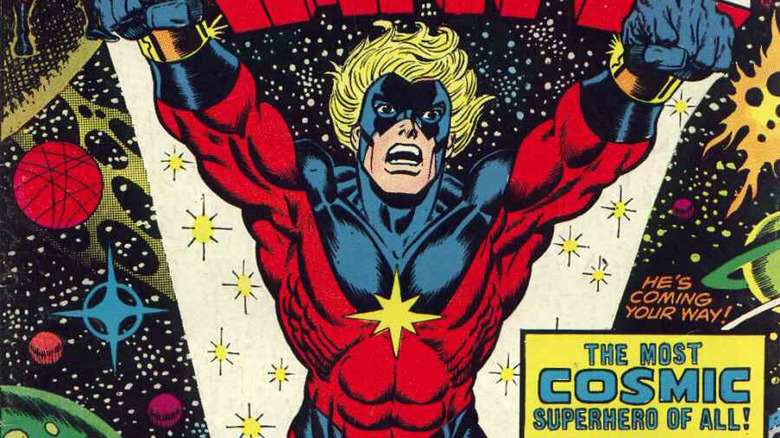 Their Captain Marvel was a spacefaring soldier of the Kree race named Mar-Vell who had come to Earth on a mission of conquest and decided to become a cosmic hero instead. In an interesting twist, Mar-Vell was revamped in 1969 by Gil Kane and Roy Thomas, a noted fan of the Golden Age in general and Fawcett's Billy Batson in particular. In this new direction, Mar-Vell had a new red costume with a big yellow insignia on the chest and a young sidekick, Rick Jones, with whom he switched bodies in a flash of light whenever a hero was needed. Weirdly enough, nobody ever launched a lawsuit on that one. Needless to say, the fact that both DC and Marvel were publishing superheroes named "Captain Marvel" — let alone the fact that there would be multiple Captains Marvel at Marvel Comics over the years —caused no end of confusion. 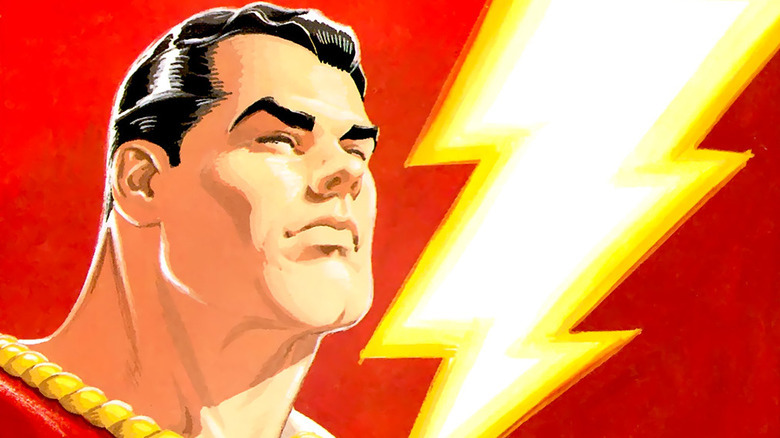 Eventually, when the DC Universe was rebooted with the "New 52" in 2011, the name change became official for the character, and Billy Batson's alter ego was rechristened as Shazam. When they revived Captain Marvel in the 1970s, DC licensed the character from Fawcett Publications. Over the next 20 years, there would be multiple attempts at reviving the character, including incorporating him into the DC Universe proper — rather than his own setting of "Earth-S" — after Crisis On Infinite Earths. None of them managed to stick around, though. In 1991, however, DC made the Shazam Family a permanent part of their universe, acquiring the rights to the character outright. At the same time, veteran creator Jerry Ordway was assigned to reboot the character yet again in the pages of a fully-painted graphic novel called The Power of Shazam! In addition to re-telling Billy Batson's origin, this story also tied him more closely to Black Adam, who had his own civilian identity: Theo Adam, a greedy archaeologist who murdered Billy's parents while on a dig. Released in 1994, The Power of Shazam was an unqualified success, and led to the launch of a monthly title of the same name the next year. Ordway would write and provide covers for the series, and draw a fair bit of it, too. 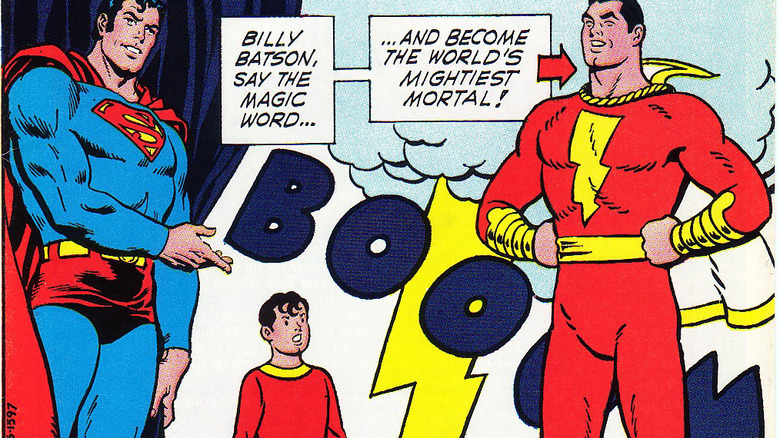 With 48 issues (including a "#1,000,000" special that revealed Billy would take the role of the wizard Shazam in the distant future), it was, and is, the longest-running Shazam series since 1954. After the DC Universe was rebooted for "The New 52," Shazam started appearing as a backup story in the pages of Justice League. In addition to a new costume and a new origin for Dr. Sivana, this version's Billy Batson wasn't quite the wholesome, good-natured kid he'd been in the past. Instead, Geoff Johns and Gary Frank reimagined him as far more bitter and cynical than readers had seen before. His first act upon meeting the wizard Shazam, for example, was to accuse him of being a child molester, and after getting his powers, he asked a woman for $20 in return for saving her from a mugging. The idea, of course, was that much like Peter Parker, his initial suspicion and self-interest would give way to a genuine heroism and an affection for his adopted family. There was one other big twist, though. 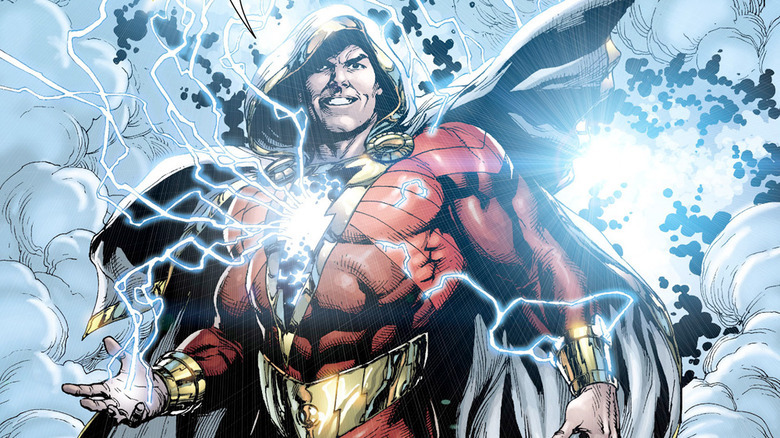 In the pages of Flashpoint, the universe-ending event that led to the New 52 reboot, readers got a glimpse of a version of Shazam who had split his powers among six kids. This in itself wasn't a completely new idea — Mary Batson and Freddy Freeman had been turned into Mary Marvel and Captain Marvel Jr. the same way, as had a few other characters all the way back in the Golden Age. This time, though, Billy decided to split his powers not just with Mary and Freddy, but with his foster siblings Darla, Pedro, and Eugene. The result is a whole team of heroes with a much more diverse cast than previous versions of the Shazam Family, who will all be appearing alongside each other in the pages of the next Shazam title. Way back in 1941, Captain Marvel made his big screen debut in a Republic Pictures serial, beating Max Fleischer's animated Superman cartoons to the theater by six months and predating a live-action Superman serial by seven years. Now, in 2019, Billy Batson is set to return to the movies in Shazam. 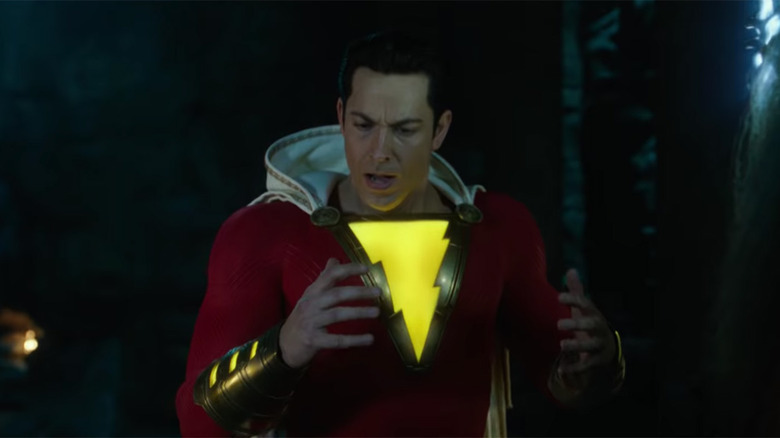 With Asher Angel as Billy Batson, Zachary Levi as Shazam, and Mark Strong as Dr. Thaddeus Bodog Sivana, the film appears to be sticking pretty close to Johns and Frank's 2012 version. A trailer that debuted at Comic-Con International 2018 recreates a few of the scenes seen in Justice League #0, and the cast list includes newer characters like Darla, Pedro, and Eugene as well. Sadly, no word on whether anyone's been cast as Mr. Tawky Tawny, a tiger that wears a suit and tie and hangs out with Billy and the kids sometimes. Weirdly enough, while he's been attached to the project longer than Levi, Strong, or director David F. Sandberg, Dwayne "The Rock" Johnson won't be appearing in Shazam. He's been cast as Black Adam in DC's cinematic universe, but Warner Bros. has announced that they'll be featuring the character in a solo film before he crosses paths with his old nemesis — although plenty of fans have speculated that he might show up in Suicide Squad 2 first.